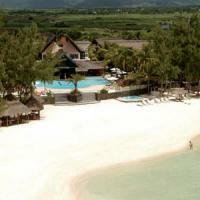 LOCATION: Ambre Hotel is on the sheltered bay of Palmar in the east coast at Belle Mare in Mauritius - along a beach of 1km of white sand and the turquoise blue sea of Mauritius. 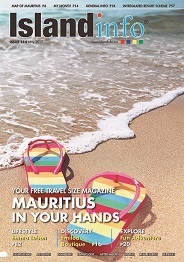 55min to Mauritius' main airport and 40 min to Port Louis, the capital of Mauritius. 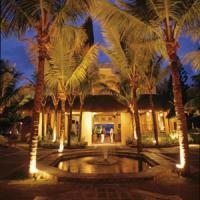 DESCRIPTION: A luxurious hotel, ideal for holidays in the Tropics as well as for seminars and meetings. 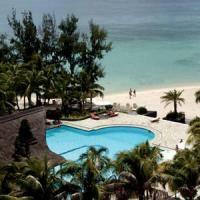 246 rooms including 20 presidential suites with private access to the beach. The air conditioned standard rooms are spacious with king size beds, lounge, TV, video (2 channels), radio, mini bar, individual safe, large bathroom with tub, bidets, double sinks, hair dryers and separate toilets. Also 6 communicating and 10 family rooms with 3 beds and possibility to add an extra bed. Les Filaos: buffet style restaurant. At night, becomes an "a la carte" restaurant. Les Alizes: grill-pizzeria on the beach under straw huts with "a la carte" service. 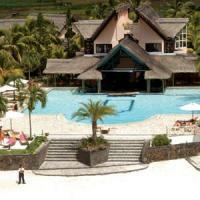 Le Sirne: main bar with dance floor bordering the swimming pool. The Beach Bar: underneath palm trees and filaos pine on the beach. Le Nautilus: night club, open every night from midnight. Entrance free. L'Hibiscus: piano bar for quiet relaxation listening to background jazz music. 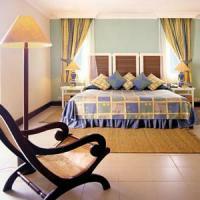 Upstairs lounge, overlooks the lagoon of Mauritius, a quiet spot for indoor games and billiard tables. Conference facilities, in 2 Air Conditioned lounges. Live music and entertainment every night. Welcome lounge, information desks, car rental, taxis, luggage service with porter, bookings, secretarial/fax services, dry cleaning, receptions, arrival and departure lounges, 3 boutiques and hairdresser. Ground sports: floodlit tennis courts, volley ball, bocci balls, mini golf etc. Water sports: water ski, sailing boats, windsurfing, pedaloes, glass bottom boat, rental of equipment (flippers, snorkel and masks). Diving Centre: with qualified instructors PADI & CMAS. Keep Fit: 500 sq mtr swimming pool, 2 jacuzzis, sauna, aquatic gym, aerobic, massage centre (extra) etc. Mini Club: For children from 3 to 12 between 9.00am to 9.00pm - playground, swings under the filaos pines, boat outings, beach games, drawing room, video films and games. Babysitting service (fee paying). SPA HEALTH CENTRE (THALASSORUM): Balneotherapy, Sauna, Steam Bath, Cardio Fitness Centre, Spas, Rest Room, Beauty Care, Massage, Individual Care, Boutique.